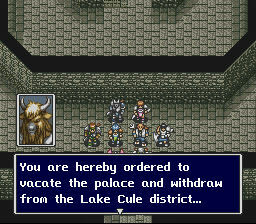 FEDA, I believe, is one of those games that could have done well if it had been published in the USA. 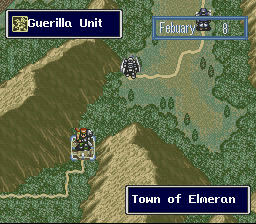 It is a strategy RPG with a lot of depth, and is probably most similar to the Shining Force series published by Sega. The game has some kickin’ graphics, but the music is kinda ho-hum, but I’m playing it on an emulator so it probably sounds totally cool on a real SNES. Anyway, give the game a try, I’m sure you’ll totally love it. Unless you’re Spinner 8. Then you’ll try it and totally die a lot. 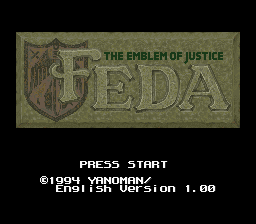 The background of the English version of Feda is really the story of one man’s efforts that span a number of years, perhaps a decade or more. Along with many people in the 1980s and 90s, Bongo` (his translation community name) became enamored with video games, specifically role playing games (RPGs), and soon discovered that a treasure trove of outstanding Japanese RPGs would never be ported to the western world. 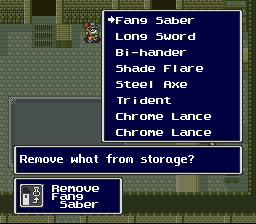 Unlike most RPG players, however, Bongo` possessed a unique skill in computer code savvy and program writing, and putting himself in even rarer company, he dedicated those skills to endeavors such as creating an English patch for Feda, his long term signature project. Be sure to read the Readme! This project was originally released by Magic-Destiny/Stealth Translations which have merged to form Dynamic Designs. It is now offered and maintained by Dynamic Designs.